As I have repeated numerous times, those looking for massive inflation can find it in China, not the United States. Demand for credit is so insane in China, that businesses will go to any length to get it. In this week’s newsletter I will argue that in spite of the rising wages, appreciating currency, and interest rate hikes we’ve seen in recent months, China is not actually rebalancing. Instead it is creating a change in the structure of the industrial base that may, unfortunately, be the opposite of what Beijing says it is aiming for. 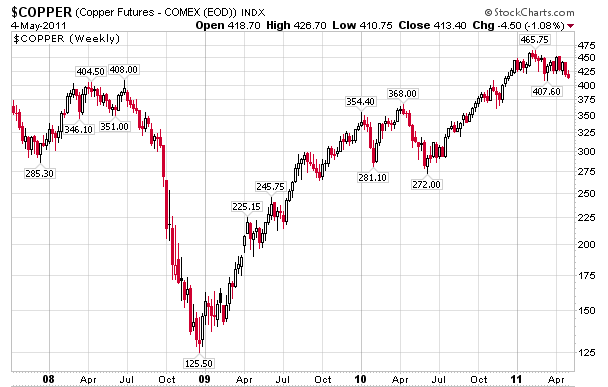 But before getting into why, I want to bring up once again the goings-on in the commodity markets. Since January I’ve been writing about – and trying to figure out – the strange happenings in the Chinese copper market. The issue has been a regular topic of conversation in my central banking seminar at Peking University, where much of the most imaginative analysis I’ve seen has been done. China had been importing for many months far more copper than was needed for real use – and this in spite of a huge surge in domestic infrastructure and real estate development which has boosted the demand for copper. Imports continued even when London prices exceeded Shanghai prices by more than the equivalent of China’s value-added tax. Instead of being shipped to end users, it seems that copper was being stockpiled in warehouses. Why? One possibility of course was pure speculation. If you think domestic Chinese copper use is going to soar, and with it prices too, then it might make sense to buy copper and hoard it. But there seemed to be a lot more hoarding than normal, and anyway with London prices often above the tax-adjusted Shanghai prices, why would anyone want to speculate on foreign copper when it could be bought more cheaply domestically? It turns out, that the copper purchases were not entirely, or even mainly, speculative. They were part of a financing scheme for companies that, in spite of the avalanche of new lending occurring both within and outside normal RMB lending, were having trouble accessing bank credit. credit-starved companies were importing copper because they could obtain trade finance or some other sort of foreign financing, and then used the physical copper (or warehouse receipts, I guess) as collateral for domestic borrowing. The financing was continually rolled over. Buying copper was just a way to borrow for companies that needed loans and were otherwise unable to get them. As I mentioned two weeks ago, when I discussed this in February with a senior executive in a major commodities company, he responded by saying that he thought the same thing might also be happening in soya. Borrowers are resorting to some fairly convoluted and expensive ways of obtaining short-term credit largely because they cannot obtain financing from the local banks. Here’s how it works. Even when London prices are above Shanghai prices, companies eager for loans are importing copper in order to get back-door financing, whereas local traders, noticing that domestic demand isn’t strong enough to justify those import quantities, and perhaps eager to arbitrage the prices, are selling copper abroad. The weird distortions in the banking system, where credit isn’t rationed by price but by quantity and hierarchy, has turned China, at least temporarily, into a revolving door for copper imports and exports. 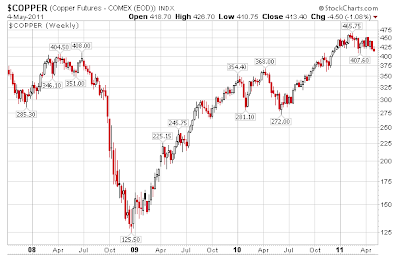 This is great for copper traders, of course, but perhaps not so good for the overall economy since someone has to pay for those outsized trading profits. I still need to find out more about this. I am only speculating and I don’t have real data to support me, but it does fit together nicely into a pretty consistent narrative on everything we are hearing in China, both about copper and about credit. 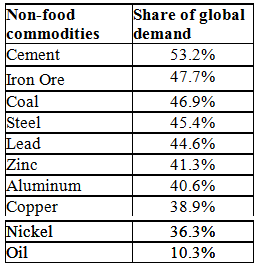 What is most noteworthy about these tables, of course, is the disproportion between China’s share of global GDP and China’s commodity consumption. 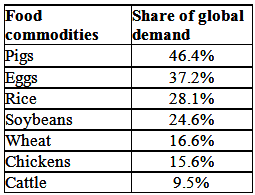 The tables give a very good sense of what might happen to global demand for various commodities as China rebalances. Take iron, for example. If Chinese demand declines by 10%, this would represent a reduction in global demand of nearly 5%. I am not an expert in the commodity markets, but I guess that supply and demand considerations are fairly finely balanced, and a 5% reduction in demand should have significant price repercussions – especially if a material part of Chinese demand represents stockpiling and this stockpiling is reversed. Note that those companies holding copper, especially those new to this wild financing scheme, are very vulnerable to a decline in the price of copper. Alternatively, those companies taking out loans based on copper collateral then selling the copper back to the exchanges have managed to get loans with no collateral. Interestingly, Pettis insists that credit cannot really be considered tight in China, rather demand for credit has gone through the roof. In my model, rapidly expanding credit is a sign of a huge inflation problem. For comparison purposes, many forms of credit are still stagnant or declining in the US. This is supposed to end well? For who? There is much more in Pettis' email including a more detailed discussion of China's rebalancing that is not happening, who pays for the adjustment, and currency valuations. Under terms of agreement with Pettis I cannot print the entire email so I picked the section on commodities to excerpt. Pettis will post more on his website later.